Anyone familiar with the songs of the renowned American satirist Tom Lehrer will be familiar with the story of Oedipus Rex(to quote Lehrer, "He loved his mother like no other, his daughter was his sister and his son was his brother, one thing on which you can depend is, he sure knew who a boy's best friend is"). 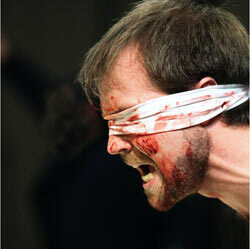 This low-key and smartly staged piece of theatre from Black RAT Productions adds much to the traditions and vocabulary of Greek theatre in that adaptor/director Richard Tunley has attempted to focus upon the fall from grace of Sophocles' central character, whose life - as stated in the programme notes - "crumbles in the space of a day". Gareth Bale - best known to Swansea audiences for his work with Wales Theatre Company - plays opposite Laura Bridgwater as Jocasta, and while the central performances are fine it is the physicality of the piece that resonates in the memory: the sequences involving the Greek chorus are especially effective, with a wider mix of age ranges than would normally be utilised in more traditional versions, and include community-based actors as well as professional players. This is a fine addition to Black RAT's canon of work, which includes touring productions of Miss Julie and A Zoo Story, and demonstrates that even the most ancient of plays(Oedipus was written circa 425 B.C. )can be rendered accessible to modern audiences.